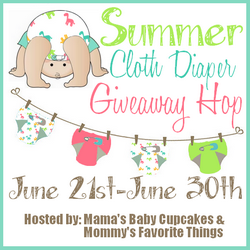 Welcome to the 3rd annual Summer Cloth Diaper Giveaway Hop hosted by Heather from Mommy's Favorite Things and Mama's Baby Cupcakes. This hop is focused on items you'd want/need for everything cloth diaper related! After visiting my giveaway, make sure you use the linky below to take a look at the other 20+ blogs and see what they have to offer for you and your little one! Each blog has a minimum prize package of $25 per winner. Be sure to enter the Grand Prize as well where one lucky US winner will receive the $375 prize. 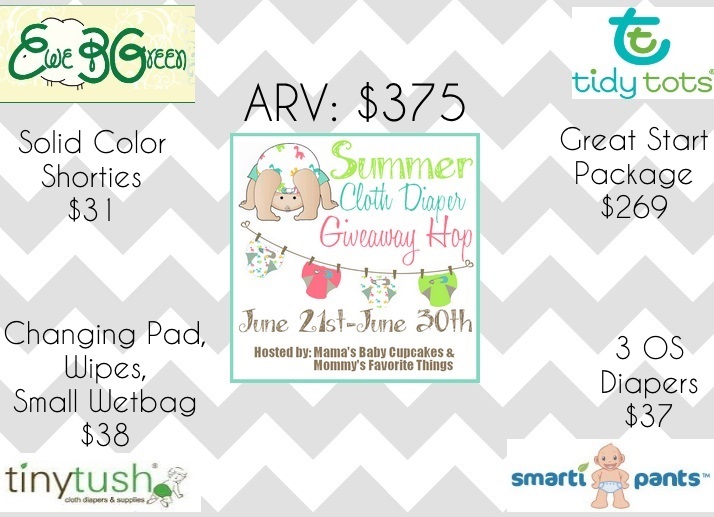 With great sponsors like EweBGreen, Tidy Tots, Tiny Tush, and Smarti Pants this package offers a little something for everyone or a great package for someone wanting to start cloth. For my giveaway, Lil Bums have been so generous and would love to give one Delightful Ideas readers Lil Bums Cloth Diaper Starter Kit - 6 Pack a $99.99 Value! To enter simply use the rafflecopter widget below. This giveaway is open to all US Residents only. The 6 pack Starter Kit has everything you need to start cloth diapering your baby. Lil Bums one size cloth diapers are the softest cloth diapers on the market. We use organically grown bamboo cotton inserts for an extremely comfortable fit that will prevent rashes. Super durable snaps allow the diaper to be adjusted to fit any baby from newborns to toddlers. An inner stay-dry suede lining is used to wick moisture away from your baby’s skin and give the inside of the cloth diaper a stay-dry feel.The waterproof backing and elastic leg openings make for a leak proof fit and the best cloth diapers. Available in a wide variety of fun colors and patterns, Lil bums cloth diapers are a great way to go green while saving you money. Please take the time to click on the banner below. This will cast a vote for my blog and helps me with hooking you guys up with great products such as this. a Rafflecopter giveaway Disclosure: Mommy's Favorite Things, Mama's Baby Cupcakes and the Summer Cloth Diaper participating bloggers are not responsible for a sponsor who does not fulfill their prize.